So, I just installed GIMP on my new laptop, and the brush tools don't want to work. Anything that involves you drawing on the page refuses to do anything. The eraser, airbrush, pencil, paintbrush, all of it behaves the same way when I try to use it. When I click, the brush indicator stays where I clicked, nothing happens, and the indicator doesn't move no matter how much I move the mouse with the button held down. I've made sure that nothing is selected, I made sure that I was on the correct layer, the pixels aren't locked, and the opacity is at 100% on the tools and the layer that I was working on. I tried re-installing it, but nothing happened. I also went under Edit -> Preferences and re-set them to the default just to be sure, but nothing changed. Quote: When I click, the brush indicator stays where I clicked, nothing happens, and the indicator doesn't move no matter how much I move the mouse with the button held down. That reads to me as a hardware issue. Is it a standard USB mouse or a laptop trackpad or something else? A new laptop, so assuming Gimp 2.8 was not there to be replaced by Gimp 2.10 Reinstalling Gimp rarely works because the Gimp User profile C:\Users\your-name\AppData\Roaming\GIMP\2.10\ is left behind. That might hold a corrupt configuration file. You could try deleting that, start Gimp to create a new default user profile. Might work. First, I tried using the track pad mouse that comes with the laptop. When that didn't do anything, I thought maybe it was acting up, so I plugged in my USB mouse that I've had for a little while, was was working on this laptop just fine, and it still does this. And, using other non-brush-based tools work OK. All of the select tools, the path tool, reflect, rotate, etc. still work fine. 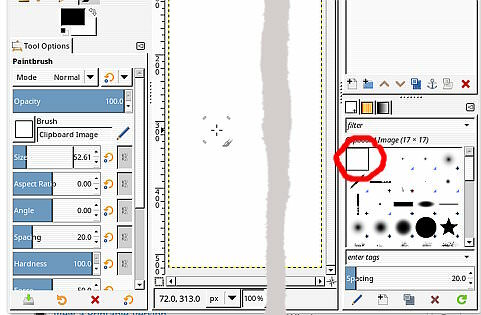 I also have another question - should the brush indicator always be a square? No matter what brush I pick, even the basic round ones, the indicator is almost like a square with no edges. Which, now that I think about it, would make it really hard to use for detailed work, now that I think about it. This bit still has me beat, the mouse pointer not moving. At first I thought the brush might be stuck on an empty 'clipboard brush' example https://i.imgur.com/cNkPi57.jpg. That would explain none of the paint tools working, but you said that you tried other standard brushes, so not that. Quote: I also have another question - should the brush indicator always be a square? No matter what brush I pick, even the basic round ones, the indicator is almost like a square with no edges. At least I can answer that one. Edit -> Preferences -> Image Windows In the Mouse Pointers section. Tick boxes for brush outline and then the Pointer mode has Tool Icon / cross hair options. Sorry I can not help any more. Did you delete the Gimp profile as recommended? Yes. I did when I uninstalled, and got a new installer. I Decided to install it with a new installer just because sometimes, downloads aren't perfect, and sometimes some of the files it installs don't work properly. The reason I made this thread was because I couldn't find the installers for 2.8 at first.